Babblings of a Mommy: Beauty Tip Of The Day: Flawless Foundation. Beauty Tip Of The Day: Flawless Foundation. I have far from perfect skin. I HAVE TO wear foundation if I don't want to scare away people in public. Have the same problem too? 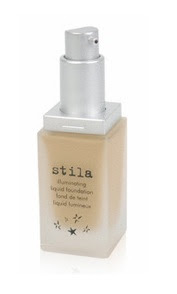 Val Garland, a make-up artist for MAC, says "to make your foundation look less like makeup and more like naturally flawless skin …use a good primer and an illuminating foundation (try Stila Illuminating Liquid Foundation). After applying your foundation, take a dab of moisturizer and warm it in your hands, then pat it over your skin for a more natural look. It softens your foundation." I tried this tip this morning and I got say, it actually works! After applying my foundation I took a dab of my favorite moisturizer, rubbed it together, and patted it on my face (think like putting on after shave) and my foundation was less cakey and more natural looking! Give it a try, and let me know if it worked for you too! Your welcome. Hope it works for you! When I wear liquid (I actually wear what you posted there) I mix it with my moisturizer before I put it on. Seems to work for me....but seriously, I am far from a makeup expert, lol.